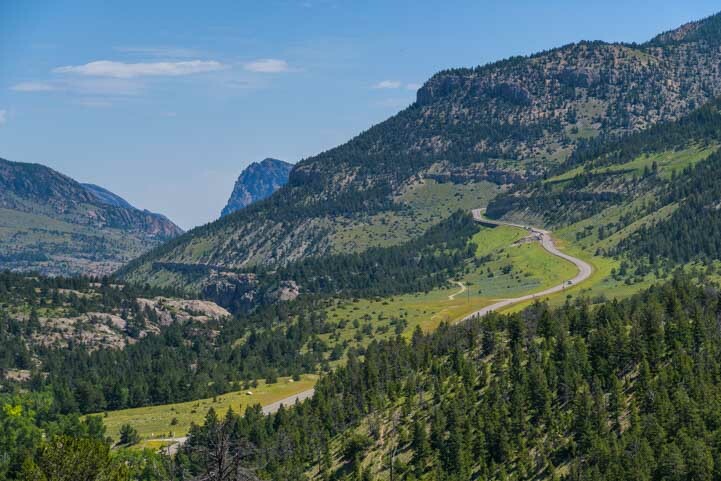 July 2018 — The Chief Joseph Scenic Byway is a gorgeous scenic drive that forks off of the Beartooth Highway in Wyoming. 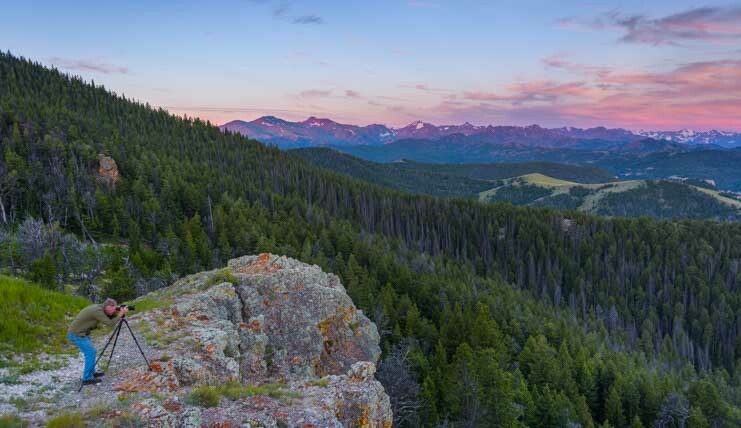 It’s not as well known as the Beartooth Highway, but the views are jaw-dropping. 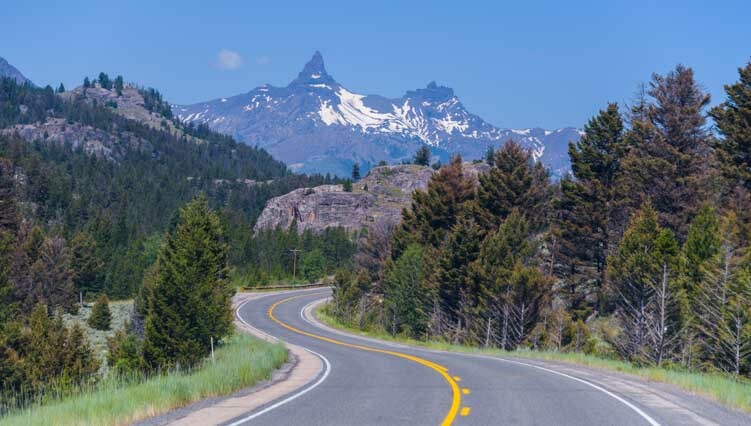 We had driven the Beartooth Highway several times as an out-and-back trip from Red Lodge, Montana, our mouths forming a permanent “Wow!” every time we drove it. 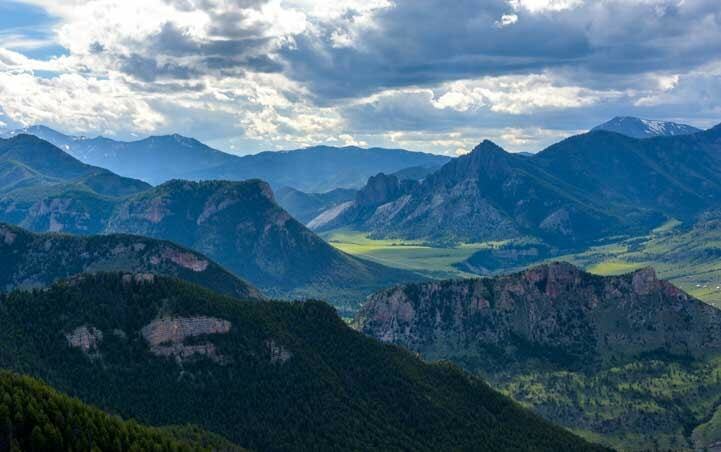 And each time we passed the turn-off from the Beartooth Highway onto the Chief Joseph Scenic Highway we craned our necks, wondering what that other scenic drive was like. 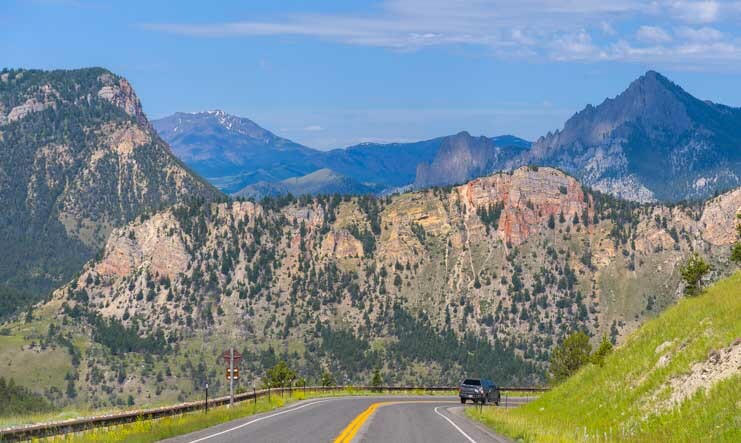 The Chief Joseph Scenic Highway wanders through the mountains. 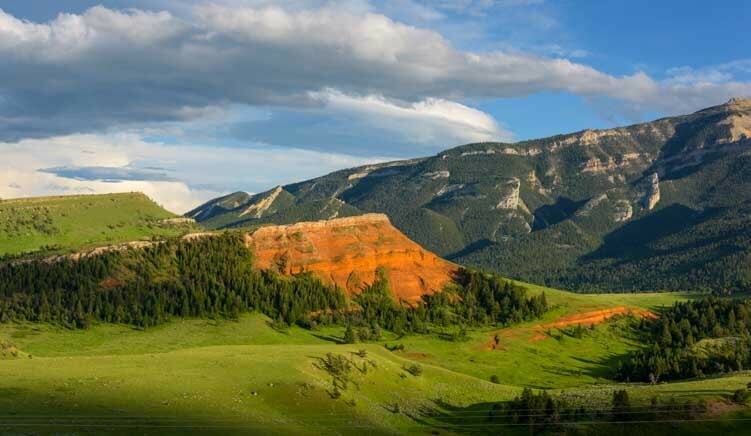 After spending a very special 4th of July in Cody, Wyoming, we used that town as a home base to drive the gorgeous Chief Joseph Scenic Byway out to where it interesects with the Beartooth Highway and back again. We loved it so much we drove it a few more times, catching it in a different light on each drive. 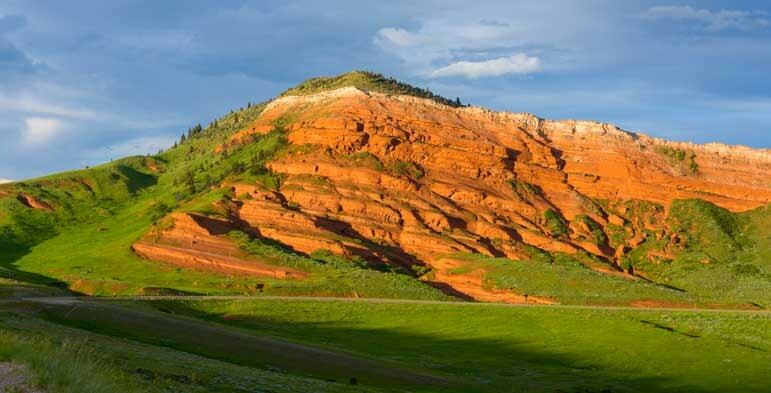 Not far from the start of the Chief Joseph Scenic Byway (which is about 17 miles northwest of Cody), we rounded a bend and were shocked to see some huge outcroppings of red rocks. It was a little touch of Utah right there in Wyoming! Turning a big sweeping corner we came across some red rocks peeking out of the greenery. 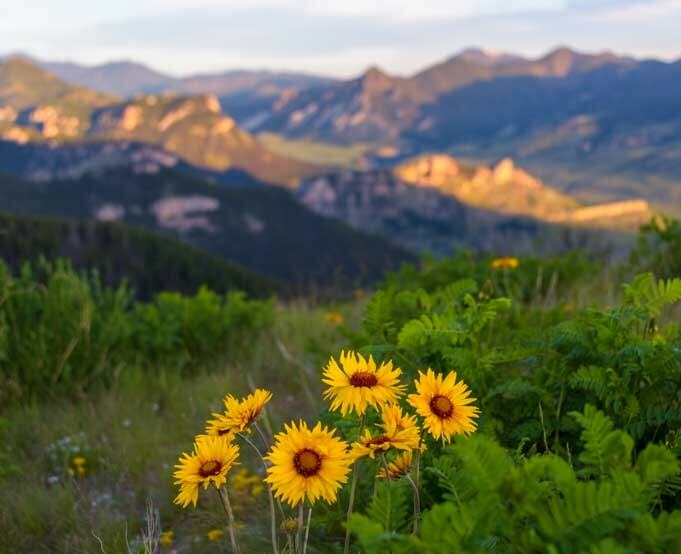 We think of Wyoming as being home to tall craggy mountains and woods and open grasslands. What a beautiful surprise to see red rocks glowing orange in the late afternoon sun. At the golden hour just before sunset the red rocks lit up in vivid shades of orange. The rain had fallen so consistently for so many weeks during the spring that everything in Wyoming was green and lush. 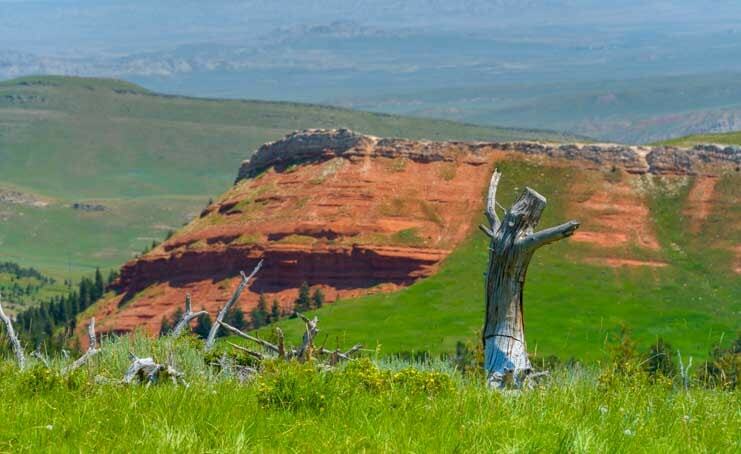 The red rock hillsides were partially covered in a thick layer of tall grasses and green trees. From a distance it almost looked like moss. Intense rains had made the grass surrounding and growing on the red rocks very lush. 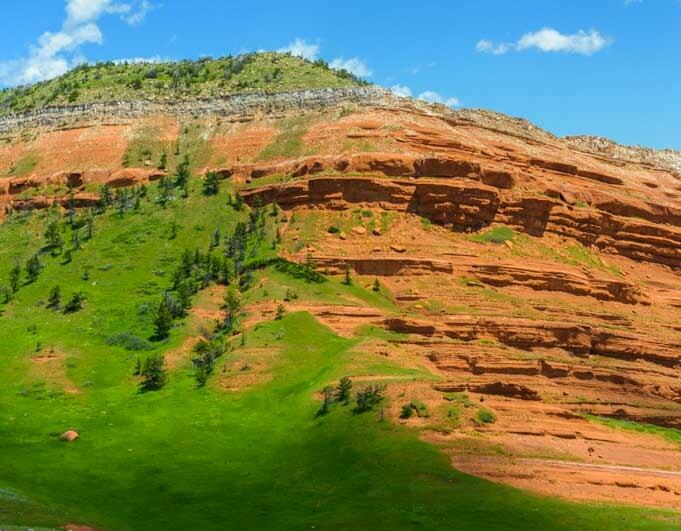 From a distance the greenery may have resembled moss, but these red cliffs are immense and you can see evergreen trees growing on the hillsides. We got out of the truck and wandered around on the hillsides for a while. An old, bleached tree trunk looked like it had it’s arms outstretched to the heavens! 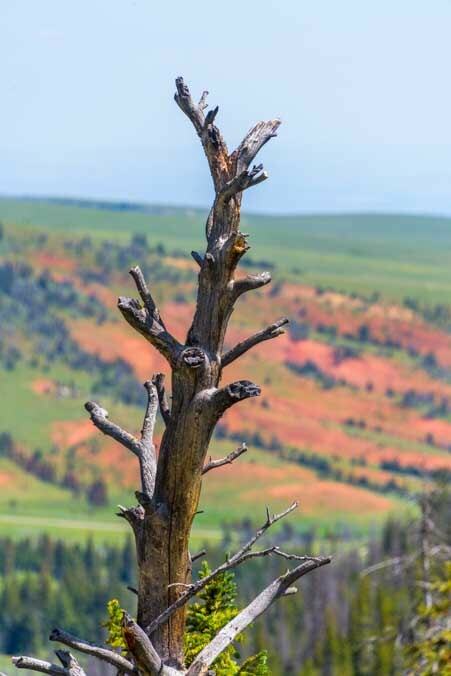 Another bare tree trunk finds new life among the red rocks. A little further on we came to a fabulous overlook at the Dead Indian Summit. There is a big viewing platform and the view is out of this world. At Dead Indian Summit the views went on forever. We could see the Chief Joseph Scenic Byway snaking through switchbacks into the valley below. 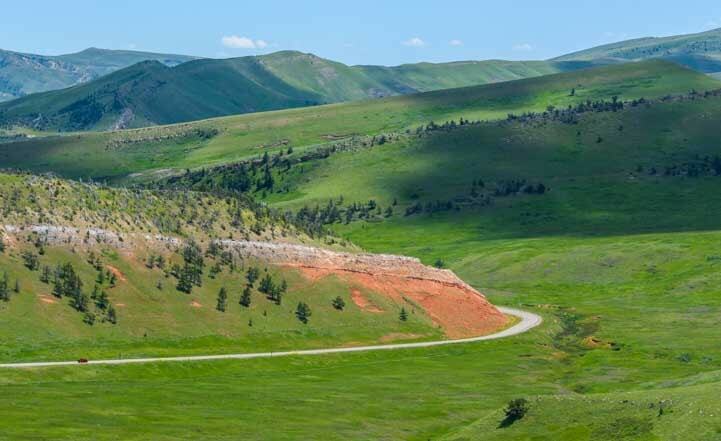 The Chief Joseph Scenic Byway wanders down into the valley with lots of switchbacks. We had arrived in late afternoon, and the view was backlit by the sun. We thought this overlook might look best in the morning with the early morning light filling all the nooks and crannies, so we got out of bed before dawn one morning to catch the sunrise at the summit overlook. We needed cloud cover in the west that would pick up the beautiful colors of sunrise slightly after the sun rose in the east. But we wondered if we’d done the right thing as an incredible sunrise developed behind our backs, mostly blocked by a large berm. Arghh!! However, just as we were giving up and figuring we’d blown it and the sunrise was going to be a one-part-of-the-sky-only event, suddenly the clouds to the west in front of us began to turn a soft pink. Same Dead Indian Summit view at sunrise! It turned out to be well worth the pre-coffee driving adventure to get there in time for this celestial show, and we were so glad we hadn’t given up and had stuck around long enough to let the sunrise creep across the sky from east to west. It was soooo worth getting out of a warm bed to come witness this sunrise! Mark hung out on a cliff getting great pics. As the sun rose higher, the mountaintops lit up and wild daisies began to slow dance in the soft breeze. Once the sun crested the horizon the distance peaks lit up in delightful contrast to the big yellow daisies at my feet. 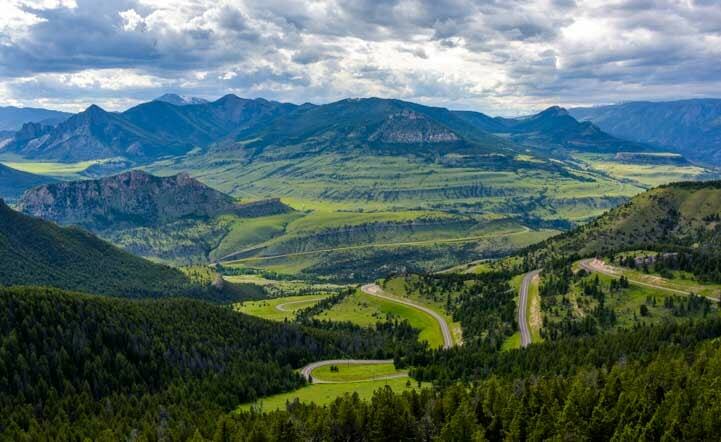 The Chief Joseph Scenic Highway is a dramatic drive through the mountains, and we savored every view. Fortunately there are lots of pullouts where you can stop to take pics! 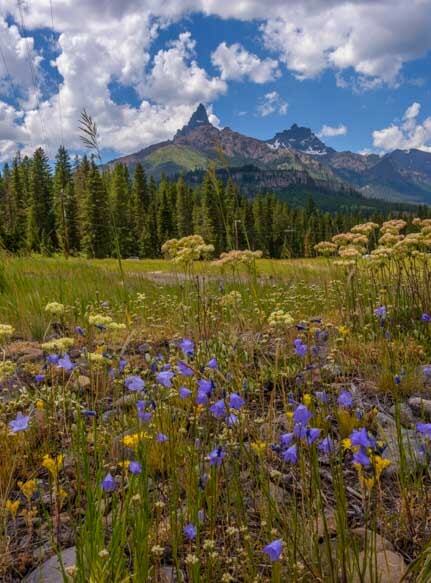 The Chief Joseph Scenic Highway offers many glorious vistas. But some of the best experiences were down the dirt roads and hiking trails that wander away from the main drag. We enjoyed hiking a few of the trails and dirt roads. While we preferred hiking on our own two feet (or four paws), others were out on horseback. 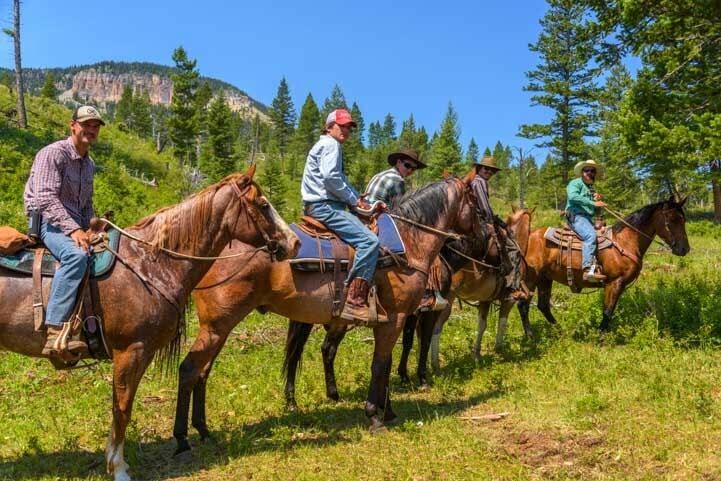 We bumped into a group of cowboys who had just done a cattle roundup on the other side of the mountain. These cattle ranchers had just finished rounding up a herd of cows! Everywhere we went along the Chief Joseph Scenic Byway the wildflowers were out sunning themselves, giving the landscape a colorful and cheery air. Colorful bouquets created by a divine hand. We took a gazillion photos, and couldn’t fit them all into one blog post. So here are a few more! Buddy and I wandered into the flowers to get a closer look (and take pics!). Buddy gives Mark a sly look as he takes his pic! 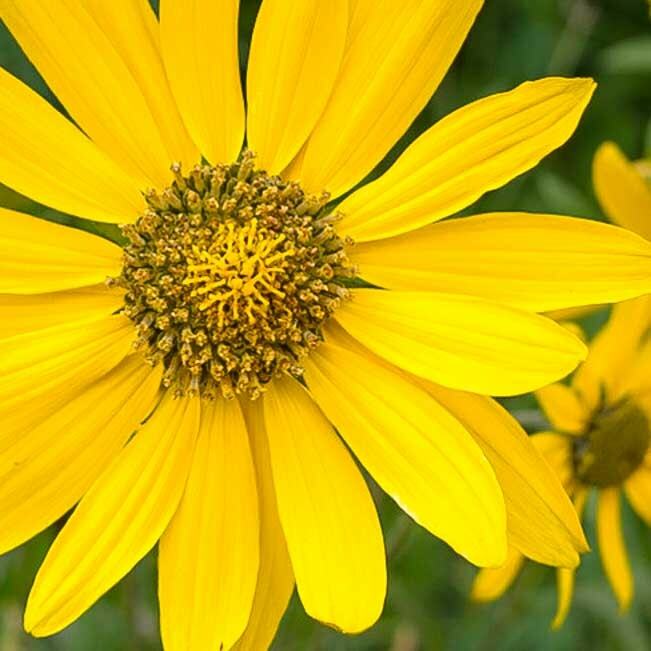 There were yellow daisies with yellow centers and with brown centers — all kinds of yellow daisies! I couldn’t have planted such a beautiful garden if I tried! 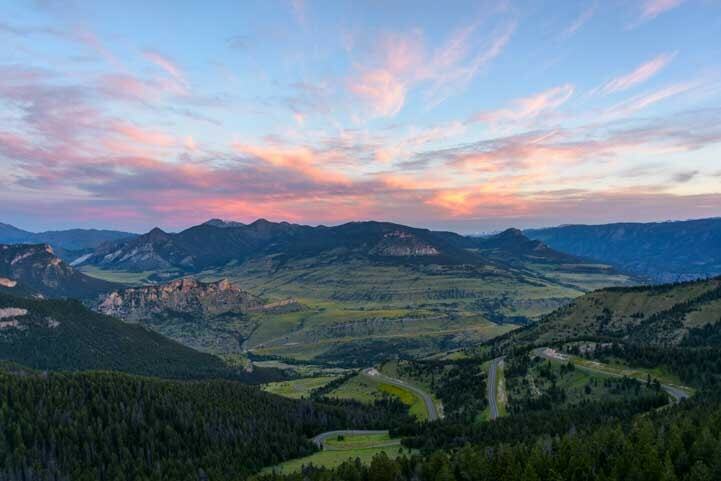 The Chief Joseph Scenic Highway eventually connects to the Beartooth Highway, and we couldn’t resist driving a little of that majestic scenic drive once again. Such gorgeous vistas! An incredible view on the Beartooth Highway! 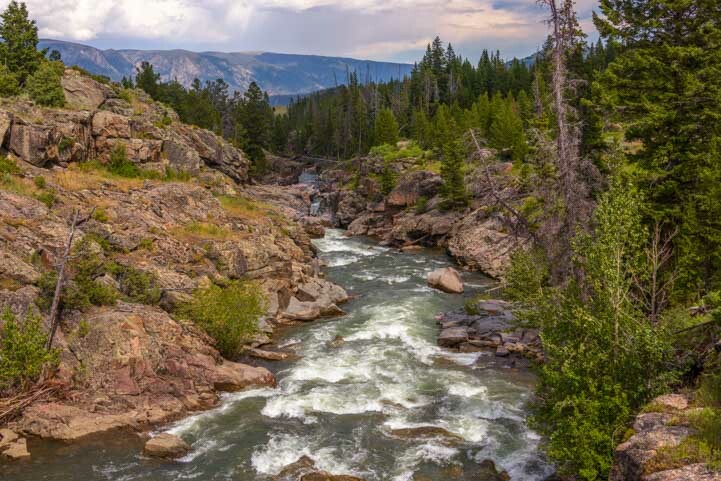 The Clarks Fork of the Yellowstone River was running fast and free. Right out of a brochure. A waterfall cascade caught our eye as we drove over a bridge. 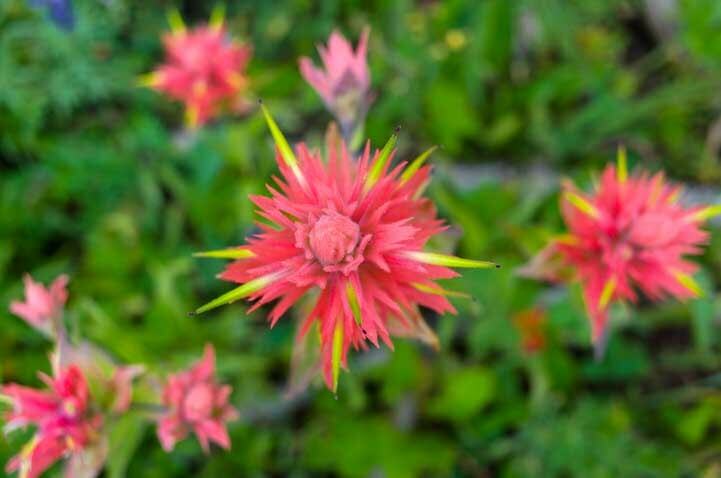 Wildflowers were in bloom everywhere on the Beartooth Highway. What luck! At the tiny village of Cooke City we stopped to stroll around. There are a few boutique shops and cute eateries. 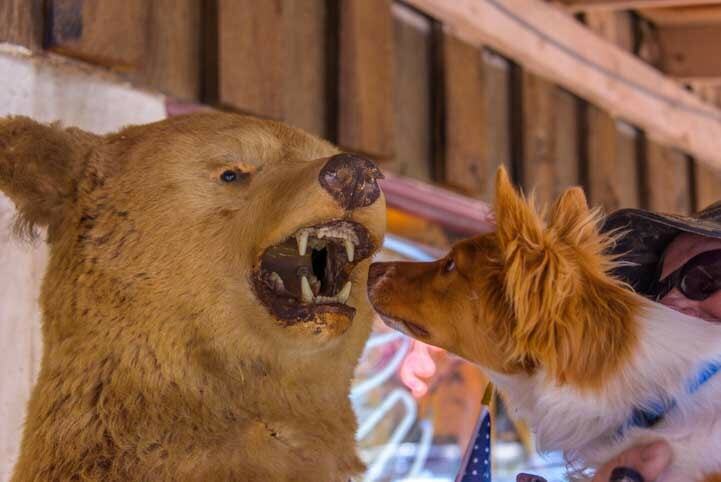 Buddy saw his first grizzly bear up close outside one store. Luckily it was stuffed! 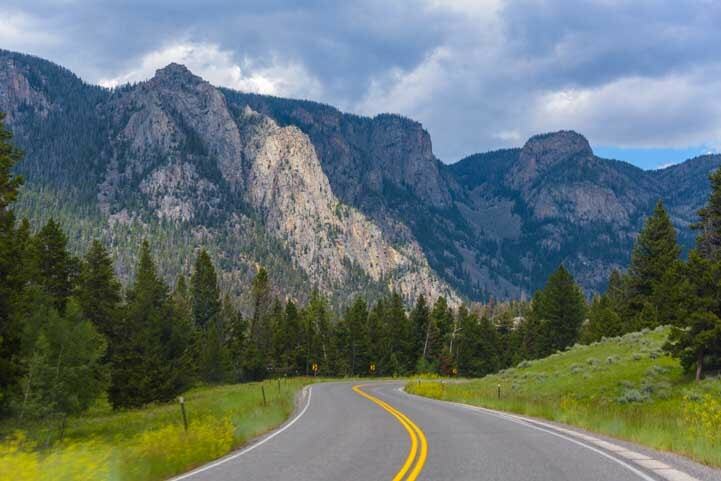 If you are traveling to Yellowstone National Park, save a few days to drive the Chief Joseph Scenic Highway out of Cody, Wyoming, and/or the Beartooth Highway out of Red Lodge, Montana. Or, if you want to do it all in one day, do a circle loop that includes both scenic drives (map link below) using Red Lodge, Cody or Cooke-City as a starting and ending point. 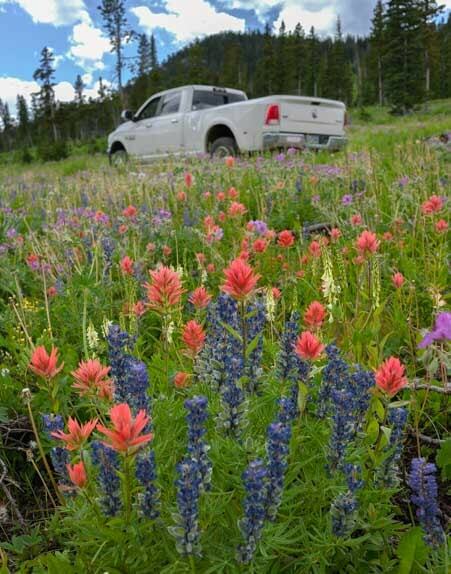 This entry was posted in Wyoming and tagged New, Top Scenic Drives, Travel, USA, Wyoming by Roads Less Traveled. Bookmark the permalink. Hello. I never comment on your posts and decided it was time. 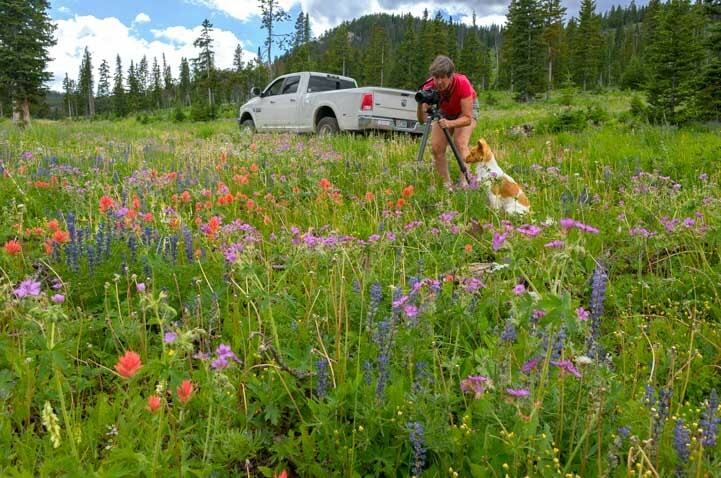 Your photos are stunning and the commentary about Montana and Wyoming have inspiried me these past weeks. We started our travels October of 2016 from Washington state pulling a 17 foot Casita. We had barely begun—a year was wonderful—but In January this year (2018) I was diagnosed with cancer. I have been in treatment since in Arizona and now Grand Junction Colorado where we are living with family while I have a second round of chemo. Your blog helps me keep the dream alive. I remember all the beautiful places I have yet to see and have the goal to continue traveling when I am finished here. Even while going through treatment I find beauty to photograph. We are an hour from Grand Mesa National Forest and the Colorado National Monument and live for the next three months on an urban farm with lots of animals. Thank you for your detailed posts, explanations of where you are, how to get there, and the lovely photos. Oh my, Martha, what a thought provoking and inspiring comment. Thank you for taking the time to write. What a wonderful time you must have had in your Casita, and how heartwarming it is to know that our pics and stories are helping keep your travel dreams alive. You are so fortunate to be healing in a gorgeous spot. Colorado National Monument is a red rock treasure in a state known for snowy mountains, and we just loved our stay there. The farmer’s markets in Fruita were a true delight during our visit too, and the lush farmland in Palisade was so serene. I remember in Lance Armstrong’s book how he said that “we cancer survivors are the lucky ones” because you’ve come face to face with our worst fears and discovered the preciousness of life! I hope you recover quickly and that your Casita takes you on wings of song to exciting new adventures in beautiful places. Thank you. Lance is correct! And thank you for your kind words of support. Beautiful! You guys always seem to find a little snow too! Loved the color of the flowers and that beautiful sunset. Thanks, Pete! 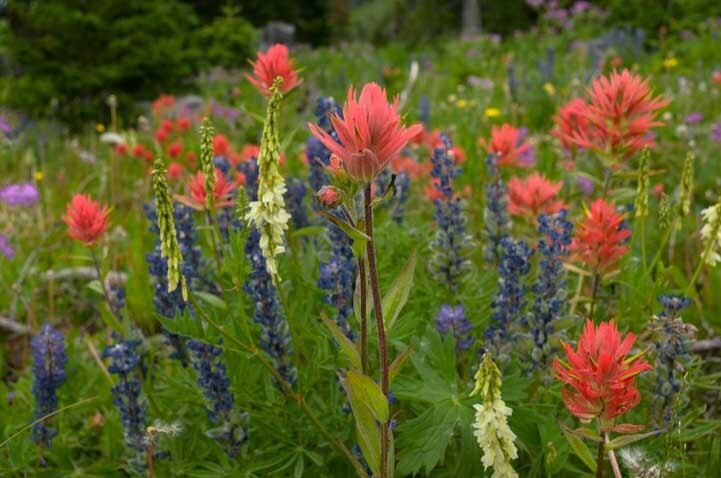 The snow is definitely receding, but we’re still finding it in the 10,000′ peaks, along with the late blooming wildflowers!! Even though I have seen many of these before reading the article, I loved seeing them again. This area is such a scenic part of our planet. It’s a fabulous area, Bob. Come on over and bring your camera!! Wow, wow and WOW! I have enjoyed your blog and fabulous photography for several months now. This one knocked the ball out of the park –and I laughed out loud at your Julie Andrews caption. Love your humor. 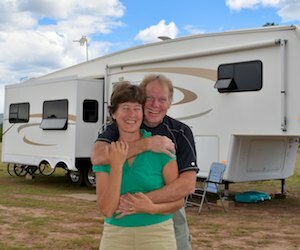 My hubby and I are newbies at RV-ing and we wanted to go to Wyoming even before your travels there. Now it’s not even an option. We must see it. Thanks for the inspiration. 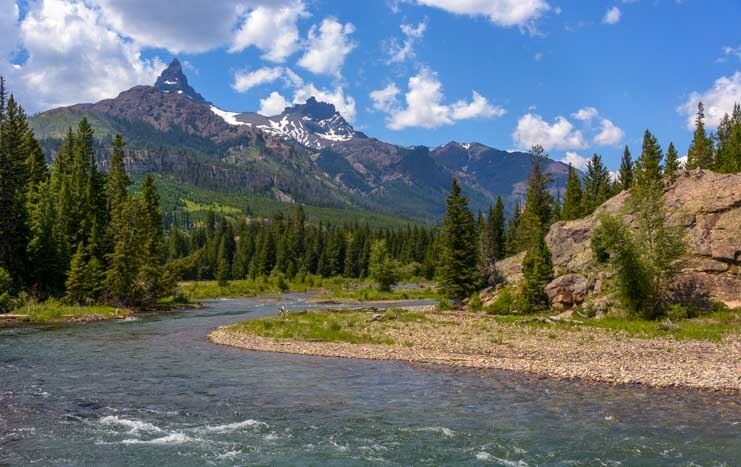 Wyoming is a truly gorgeous state, Julie, and you will love every minute of traveling there. 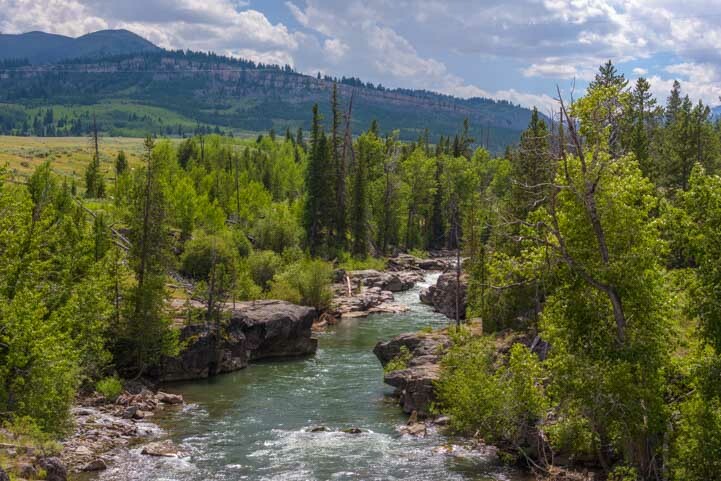 Yellowstone and Grand Teton are awe-inspiring, not-to-be-missed National Parks, but what we are loving is finding out that the lesser known areas — places that would be National Parks if they were located in another state — are just as spectacular. Thank you for following our adventures and have fun with the RV lifestyle. It’s a fantastic way to go exploring! Once again your photos and descriptions are awe inspiring. They demand a visit to these roads less traveled. Oh my, the itinerary for our spring 2019 road trip is ever expanding. We have a friend who works Yellowstone NP each summer but wish to avoid the crowds. 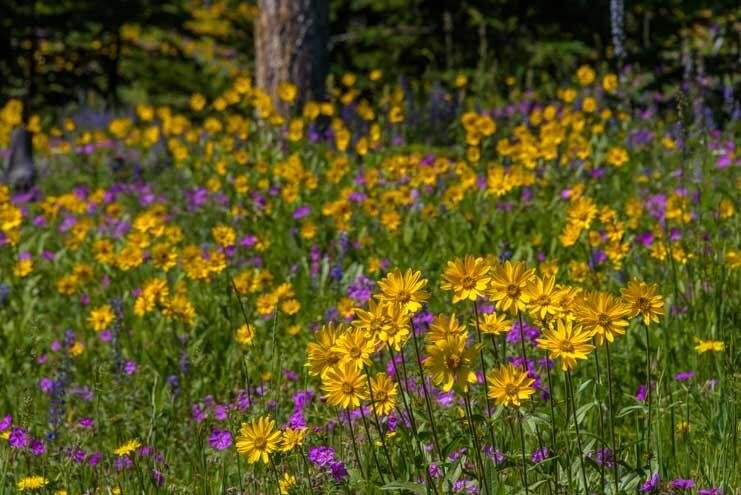 Looks like a stop in the main park in late May or early June on our way north to Glacier NP with a return to see the wildflowers on the Chief Joseph and Bear Tooth Scenic Highways as we head back east. BTW the advice you provided regarding solar panels last winter was spot on for maintaining a fully charged battery. I’m glad we’ve given you some good ideas for your travels, Stewart. This part of Wyoming is very special and I’m sure you’ll enjoy it, both on the way towards Glacier and on the way back. And how wonderful that our solar panel articles were helpful to you. Thank you for reading and appreciating our various online goodies! I hope you get back to Wyoming and the Chief Joseph and Beartooth Highways soon, Annie. What a wonderful area — well worth many return trips. We’ll be back for sure too!! Some stunning views, Emily and Mark ! 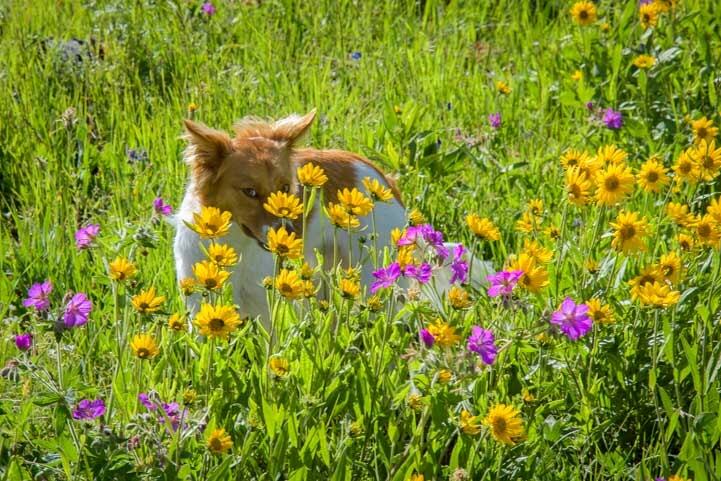 And love Buddy’s “sly” look…what a great traveler he has turned out to be…..
We’ve seen some really beautiful landscapes lately in this corner of Wyoming and Montana! Buddy is a little angel and has turned out to be a wonderful companion no matter what we are doing. He is a joy to be around — always happy and playful! Emily, I just want to let you know that the time and effort you and Mark put into your photography is very much appreciated. The two of you do all the work and I (and your other fans) get to just sit back and enjoy. Thanks for starting my day off in such a delightful way yet again! As for Buddy, I would bet that his happy and playful personality is a reflection of the atmosphere you and Mark have created. You are all fortunate to have found exceptional traveling companions in each other – enjoy every minute! Thank you so very much, Mary. We love our life and feel so blessed every day to be living it. Our photography is a natural outgrowth of living this way, and it brings us immense pleasure to capture the wonders we see, and in our luckiest moments to catch their true beauty. This blog gives me a chance to collect our favorite pics and tell the stories behind them and inspire a few folks too. 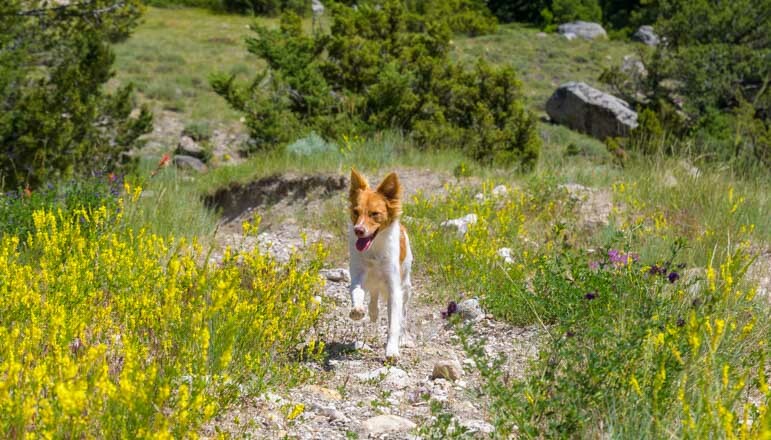 Buddy has become an incredible companion whether we’re out hiking or sitting inside on a rainy day, and even though he’s been with us just seven months, we can’t imagine life without his happy and enthusiastic presence. We’re three very lucky souls! Thanks for the great pictures. Really liked the sly one of Buddy. We traveled the highway from the northeast gate of Yellowstone back to Cody where our MH was parked. This was in mid May in a rental car. As we started on the highway it started to snow. The farther we traveled the more snow we encountered. At one point we had to go around a MH that was stranded. Talk about white nuckle driving!!! The snow was to the bottom of the little car. I slid around one curve and then bounced off the snow embankment back to the road. After going around that MH, I had two AWD vehicles pass me. The first one took off like a bat out of —, the second one seemed to sense that i might need help. He stayed ahead of me about 100 yards all the way to the bottom. When we got close to Cody he took off. I was never so happy to have that angle in front of me, breaking trail. Needless to say, we did not see all the beautiful sights that you picture. Also, the two young girls in the back seat were speechless during the whole trip. Usually can’t get them to stop talking. We all sure were glad to return to our MH and our dogs. Oh my, what a scary trip that must have been! I can’t imagine driving that highway with snow up to the bottom of a small rental car. Thank goodness it all turned out well and you got home to your motorhome and dogs safely. Your young girls probably had a lot to say once the drive was over and will surely tell that tale many times through their lives. I hope you have a chance to drive it again some day when the sky is clear and the driving is less treacherous. You’ll surely remember some of the hairpin turns, but being able to enjoy the incredible views this time around will make up for any bad memories that linger!